July 13-14 2009, the Follow-up Committee on World Conference on Dialogue held its meeting in Vienna. This meeting of religious institutions and important personalities was a follow-up to the meetings organized by the Saudi King in Mecca and Madrid. His Holiness Aram I was the only Christian Religious Leader represented. Bishop Kegham Khatcherian transmitted the message of Catholicos Aram I to the meeting. At the end of two-day deliberations, the declaration of the meeting urged King Abdullah to continue the process in order to help identify values common to all religions, cultures, and civilizations and promote justice, tolerance and peaceful coexistence among people. On June 11 2009, a joint Iran-Lebanon Christian-Muslim Conference was held in Beirut, sponsored by the Cultural Section of the Embassy of Iran in Lebanon, the National Committee for Christian-Muslim Dialogue in Lebanon, The Antonine University, The Arab Dialogue Group and the Centre for Studies and Research in Religion and Philosophy. The conference brought together Iranian and Lebanese religious leaders, political leaders and specialists on interreligious dialogue. Among the speakers were: Mr. Mohammed Hussein Rais Zadeh, the Cultural Attaché of Iran in Lebanon, Dr. Mohammed Sammak (Lebanon), Dr. Rassouli Pour (Iran), Ms. Pascal Lahoud, Sheikh Chafic Jaradi and Rev. Ryad Jarjour (Lebanon). While the speakers addressed the topic from different perspectives, each one emphasized the need to revitalize Christian-Muslim Dialogue both on official and popular levels as a precondition to sustainable relations. 29 March to 1 April a group of experts from WCC member churches and confessional families, scholars and educators met at the Ecumenical Institute Bossey, near Geneva. Mrs. Teny Pirri-Simonian was invited to join the group as representative of the Armenian Orthodox Church Catholicosate of Cilicia. The purpose of the meeting to study the listeners’ report prepared at an earlier meeting held at Chavannes de Bogis near Geneva in October 2008. The experts also discussed the keynote speech of His Holiness Aram I entitled “Living As A Community With Islam - Concerns, Challenges And Promises, and other papers presented at the first meeting The participants agreed that it was not possible to speak with one Christian voice, yet it was important to prepare together any Christian-Muslim dialogue. They also emphasized the political context in which such dialogues happen, and the role of power. At the end of the meeting they proposed a framework to be discussed by WCC Programme staff and the Secretaries of Christian World Communions. 02/12/2009On Thursday 12 February 2009, the second course of the European Project for Inter-religious Learning (EPIL) came to its conclusion at the Armenian Catholicosate of Cilicia, in Lebanon. To mark the process two important events were organized. First a graduation ceremony where the 25 students presented their projects to the Academic Team Members and to the co-founders and Co-Directors Mrs. Teny Simonian and Dr. Reinhild Traitler. Prof. Ulrich Becker, the president of EPIL made the keynote address and gave the Diplomas. In the afternoon the International Symposium was held under the auspices of His Holiness Aram I. The Symposium brought together academics, dialogue experts, theologians both from Lebanon and Europe. Among the speakers were Dr. Tarek Mitri, Minister of Information, Mr. Ibrahim Shamseddine, Minister of Administrative Reform, Dr. Manuela Kalsky, Director of the Dominican Study Center in Netherlands, and Dr. Nayla Tabbara, Saint Joseph University, Lebanon. The project grew out of the experience of Dr. Reinhild Traitler as Study Director at the Boldern Protestant Academy in Zurich, and Mrs. Teny Simonian as staff of the World Council of Churches, when His Holiness Aram I was the Moderator. The Lebanese module was made possible through partnership with Alwaleed Bin Talal Humanitarian Foundation in Lebanon, the Arab Countries, the World Council of Churches, and contributions from The Bank Beirut and Arab Countries and many parishes in Germany and Switzerland. 10/21/2007 - The Middle East Council of Churches (MECC) organized the seventh Christian-Muslim youth conference in Amman on October 17-21. Rev. Mesrob Sarkissian (Spiritual Adviser to the Armenian Church University Students’ Association- ACUSA) represented the Catholicosate of Cilicia in the conference. Over 40 young representatives from various Christian and Muslim communities were given the opportunity to get closely acquainted with the MECC and its important activities. They also talked about their communities and discussed plans for potential cooperation. - The role of the youth in establishing peace in the region. His Holiness Aram I received a delegation headed by the Head of the Higher Islamic Shiite Council (HISC) Sheikh Abdel Amir Kabalan in Antelias on June 29. Primate of the Diocese of Lebanon, Bishop Kegham Khatcherian, member of the National Council, Tsolag Tutelian, chairman of the Armenian Political Council in Lebanon, Hagop Shamelian, representative of the Armenian community in the Christian-Muslim Dialogue committee, Dr. Jean Salmanian and chancellor of the Catholicosate of Cilicia, Khatchig Dedeyan. The two spiritual leaders met for over an hour during which discussions focused on the Middle East in general and the internal situation in Lebanon in particular. Sheikh Kabalan talked with great respect about the Armenian community of Lebanon as an organized and exemplary community. He emphasized the important role of community leaders in strengthening the internal unity of Lebanon, keeping the people above internal sensitivities and personal interests and pursuing the collective and chief interests of Lebanon. His Holiness Aram I recalled his first encounter with Imam Moussa Sader in 1970 when he was still a young priest attending a Christian-Muslim international conference. His Holiness also recalled his warm cooperation with Sheikh Shamseddine, reminding his guest of the existence of a strong and an organized Armenian community in Iran. At the end of the meeting Sheikh Kabalan invited the Catholicos to participate in the Chrisitian-Muslim inter-communal meeting to be held in the center of Shiites in Hazmiyeh on July 20. The two spiritual leaders then answered the questions of reporters. The pontiff and Sheikh Kabalan condemned the recent attacks of Israel against Palestinians during their press conference. 25 April 2006 - The law studies and Islamic research departments of the University of Qatar organized the fourth international conference for the dialogue of religions in Doha on April 25-27. The conference was held under the high sponsorship of the Emir of Qatar, Sheikh Hamad Khalifa Al-Tani. The Catholicosate of Cilicia was represented in the conference by Archbishop Sebouh Sarkisian, Primate of the Diocese of Tehran and member of the Christian-Muslim Dialogue Committee of the Middle East Council of Churches (MECC). Archbishop Sarkisian conveyed the greetings of the Armenian Catholicos to the Emir and the organizers of the conference. The conference’s sessions included discussions on globalization, religious freedom, education within the family, religious diversity and mutual respect, the preservation of nature, human rights and recent scientific achievements. Archbishop Sarkisian delivered a lecture on “religion and human rights” highlighting the God-given status of human rights and the role of the Armenian Church in this field. He also spoke about the Armenian Genocide and called on Turkey to have the courage to recognize it as a historical fact. The Archbishop also met with the Armenian community of Qatar and delivered a lecture on the Armenian Genocide on April 27. At the end of the lecture, the Archbishop answered questions related to the role of the Cilician Holy See. the second international Christian-Muslim dialogue conference in Cairo on March 21-22. 03/22/2006 - The conference was sponsored by Pope of Alexandria and Patriarch of the See of St. Mark His Holiness Pope Shenouda III and Sheikh Al-Azhar Dr. Mohammed Said Tantawi. Christian and Muslim theologians and scholars participated in the conference. Archbishop Sebouh Sarkissian, Primate of the Diocese of Tehran represented the Armenian Church (the Catholicosate of Cilicia) in the conference as member of the Christian-Muslim Dialogue Committee. 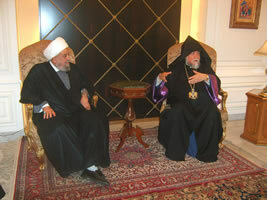 Archbishop Sarkissian held a private meeting with Dr. Tantawi on March 22. He conveyed the greetings of His Holiness Aram I and his viewpoints on the vital importance of Christian-Muslim dialogue. 02/14/2006 - Christian-Muslim coexistence should become the concern of the entire world. Any disruption of this could lead humanity into new difficulties. We live in a small world and we are obliged to live together as people and communities of different religions, nations, cultures and colors. Living together means understanding one another, respecting each other,” said His Holiness. “We don’t have the right to impose our faith, our values and our traditions on others as absolute truths. We should remain committed to the principle of freedom, but we should exercise freedom with mutual responsibility and accountability. Mutual trust should be the driving force of coexistence,” he continued. “Religion is not an aspect of an individual’s narrow reality anymore. Even in the Western world religion has an important role in society and often influential consequences within political life and in international affairs. Such issues should therefore be seriously discussed within ecumenical dialogue,” he said. "TRANSFORMING THE CHRISTIAN-MUSLIM DIALOGUE TO COLLABORATION IS A GREAT CHALLENGE"
“In pluralist societies today inter-faith dialogue is not an option but a necessity. Interaction, interpenetration and interdependence are significant features and dominant realities of modern societies. Religions, as integral components of human societies, can not remain aloof and indifferent. They are active part of dialogical interaction occurring in all areas and at all levels of society life”. This statement was made by His Holiness Aram I in a context of a press conference in Kuwait, on Saturday, 26 November, 2005. Speaking about the crucial importance of inter-faith dialogue he said : “Religion has an important place in public life; it is no more a private affair. Religion both impacts the human life in all its aspects and manifestations and is at the same time impacted by almost all developments and changes taking place in societies. Therefore, religions must work together and meet the common needs of humanity and face common challenges together. Differences must be respected and accepted, and common values must be deepened. Religions have a common responsibility vis-à-vis humanity. 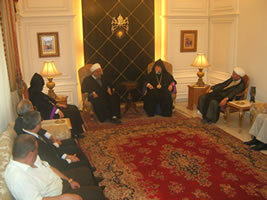 They must assume their common calling and task together”, said His Holiness Aram I. In response to a question concerning Christian Muslim dialogue Catholicos Aram I reminded that “The Christianexistential reality, it is a way of life. It is rooted in our common history. In the Middle East we don’t speak about dialogue; we live it; it is inseparable part of our life. I come from Lebanon where we don’t speak about dialogue but about a shared life. In spite of our differences we have never lost in Lebanon the sense of being part of a broader Lebanese community on the bases of common values and aspirations. In fact, the Christian Muslim dialogue as a way of life is one of the characteristic marks of the history of this region. This is not only a source of pride for us, but also a challenge and a reminder that we must deepen our collaboration in a world which is in dire need of peace with justice and reconciliation”. The reaction of His Holiness Aram I concerning a question whether “terrorism is identified with Islam” was immediate and firm: “No, this is not true and this way of looking at violence is unacceptable”. Referring to violence, Aram I said: “It is the most terrible evil of human life; we all are experiencing the destructive and deadly consequences of violence. I don’t believe that any religion, will endorse violence. All religions must join their forces to combat violence”. In this context His Holiness mentioned that in 2000 the World Council Churches has initiated A Decade to Overcome Violence. In his concluding remarks Catholicos Aram I maid an appeal to all religions and particularly to Islam and Christianity “to deepen and enlarge the common ground to face together the new challenges of societies and work together for the promotion of moral, spiritual and human values”. His Holiness Aram I is visiting the Armenian community in Kuwait. More than ten thousand Armenians live in Kuwait; they have a church, school and community organizations. The primate of the community is His Eminence Archbishop Gorun Babian. Armenians are very active particularly in the economic life of Kuwait. June 29 2005 - The Sharia and Islamic Studies Department of Qatar University convened Doha’s third conference on the dialogue of religions on June 29-30 in Doha. His Holiness Aram I was invited to the conference held under the patronage of the prince of Doha. He delegated Archbishop Sebouh Sarkisian, Primate of the Diocese of Tehran, to participate in the conference on his behalf. For the first time ever, the conference included representatives of the Jewish community of France, Britain and the United States. All the participants highlighted the importance and timeliness of such conferences and the necessity for their continuity. Archbishop Sarkisian presented a special lecture entitled “Dialogue and mutual respect.” He conveyed His Holiness Aram I’s greetings to the participants and the attendants of the conference. He reminded them that His Holiness had organized a similar conference in the Geneva headquarters of the World Council of Churches. The two-day conferences ended with significant decisions and proposals and the determination to plan and well prepare future conferences. Archbishop Sarkisian met with the Armenian community of Doha during his stay in Qatar. April 26 2005 - The American Catholic University of Washington and the Cultural and Islamic Affairs Center of Iran organized a conference entitled “Islam and political order” in Washington on April 25-26. Archbishop Sebouh Sarkisian, Primate of the Diocese of Tehran, participated in the conference on behalf of the Catholicosate of Cilicia. Archbishop Sarkisian stressed the importance of dialogue during his lecture and spoke about the contribution of the Catholicosate of Cilcia in this field. He also touched upon the issue of the Armenian Genocide and called the participants to support the Armenian people in the name of justice. Archbishop Sarkisian held meetings with senior American officials and underlined the importance of the recognition of the Armenian Genocide by the US Government. The conference was held under the patronage of Patriarch Shnouda, Head of the Coptic Orthodox Church and Dr. Mohammed Said Tantaoui. The members of the Christian-Muslim Dialogue Committee of MEEC, as well as members of the International Islamic Forum from Saudi Arabia, Egypt, Iraq and England participated in the conference. Archbishop Sebouh Sarkisian, primate of the Diocese of Tehran and a member of the Christian-Muslim Dialogue Committee, participated in the conference on behalf of the Armenian Catholicosate of Cilicia. Two lectures about dialogue and its purposes were presented during the conference. The participants discussed the common concepts and views in Christianity and Islam. They also visited Dr. Tantaoui and Patriarch Shnouda and issued a common declaration, outlining their readiness to continue the dialogue initiative. Archbishop Sebouh Sarkisian had a separate meeting with Patriarch Shnouda and greeted him on behalf of His Holiness Aram I.
Christian and Muslim youth from Lebanon, Iran, Syria, Jordan and Egypt participated in the conference. Nanar Shekherdemian participated on behalf of the Catholicosate of Cilicia and Caroline Ismayelian on behalf of the Armenian Diocese of Tehran. The participants visited the Armenian Prelacy of Tehran, where they were met by Archbishop Sebouh Sarkisian. The primate spoke to them about the Armenian Church and the Iranian-Armenians and stressed the importance of Christian-Muslim dialogue in everyday collective life. Aram I Keshishian, the Leader of the Armenian Orthodox Church, said here during the 2nd session of a conference titled 'Dialogue Between Islam and Christianity' that the relations and cooperation between Armenians and Iranians date back to remote past in world history. Speaking under the title 'Peaceful Coexistence between Muslims and Armenian Christians' at Beirut's Antlias Church, the Catholicos opined, "In addition to the historical ties between the world Armenians and the Iranians, the Armenian minority in Iran are native Iranians, enjoy full religious freedom, have three Apostolic churches there, and send two representatives to the Iranian parliament." Aram I highlighting the importance of holding dialogue among the followers of various monotheist faiths, particularly between the Muslims and Christians, said, "Such dialogues have so far paved the way for trust-building, and boosting cultural cooperation and ties between the Muslim nations and the world Armenians." He expressed hope that the continuation of consultations in the framework of Dialogue among Civilizations would lead to the elimination of misunderstandings, and boosting true and wholesome cooperation in the region and at international level. 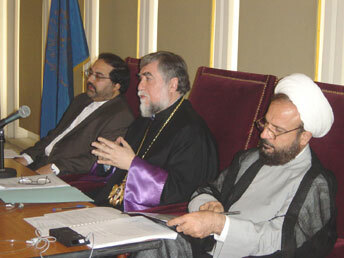 During the same session, Iranian researcher and author Mahdi Hadavi Moqaddam and the head of Tehran Apostolic Church Sebouh Serkissian, too, talked about the role played by Islam in shaping up the Iranian culture and civilization, as well as the role played by Christianity in the lives of the world and Iranian Armenians. The other speakers at the two-day conference in Beirut included a Tehrani Armenian Christian Jeans Salmanian, who focused on the history of Armenians' ties with Muslims, and Iranian researcher Zohreh Rashid-Beig who spoke on relations between Iranians and Armenians in the past and present eras. The second conference between Islam and Armenians in the framework Dialogue among Civilizations, sponsored by the Islamic Republic of Iran's Cultural Attache in Lebanon, started its activities in Beirut on Thursday. The Head of Culture and Islamic Communications Organization Hojjatoleslam Mahmud Mohammadi Araqi heads the Iranian delegation to the conference. The first conference in this series was held in Tehran in May, 2000, and was attended by the Leader of the world Armenians Catholicos Aram I Keshishian. We give thanks to Almighty God who gave us the opportunity, as the representatives of the Islamic Republic of Iran and the Armenian Catholicosate of Cilicia, to meet again to reflect together on common issues and challenges facing humanity in general, and Christianity and Islam in particular. The conference took place under the auspices of His Holiness Aram I, Catholicos of Cilicia, and Hojat e-Islam ou Muslimin Mohammad Iraki, the President of the Organization for International Inter-religious Relations of the Islamic Republic of Iran, from 20-22 May 2004, in Antelias, Lebanon. 1) In spite of their differences, dialogue is imperative between religions and particularly between Islam and Christianity. As monotheistic religions, the two religions share common values and traditions. It is vitally important, therefore, that organized dialogues aimed at closer collaboration take place between Islam and Christianity on local, regional and international levels and according to specific contexts and environments. 2) Spiritual and moral values and principles constitute the esse and the basis of a society without which a given society is doomed to lose its identity, raison d'être and purpose. These values and principles must under gird the life of all societies, including decision-making as well as internal and external relations. 3) In a world marked by growing crises working for peace must occupy a central place in Christian-Muslim collaboration. But it is not possible to establish peace without justice. In fact, peace and justice are God's gifts to humanity. Without peace and justice the life of a society will be dominated by evil forces, wars and violence. First, we fully support the right of the Palestinian people to have an independent state, and the return of all refugees to their homeland. The State of Israel must withdraw its forces from all occupied territories including the Shebaa farms in South Lebanon, Golan hights and Jerusalem. Only justice can bring about lasting, real and comprehensive peace in the Middle East. Second, we strongly support the right of Iraq to restore its freedom, territorial integrity and sovereignty. The occupying forces must leave Iraq and the reconstruction and rehabilitation process must soon start with the full and active participation of all communities and citizens of Iraq. 5) The coexistence between the Christian and Muslim communities must be based on mutual respect and trust. In this context, the organized presence of the Armenian communities in the Muslim countries and particularly in the Arab world, the religious and cultural liberties that they enjoy and the active participation that they bring in the progress of the region is, indeed, a concrete example of Christian-Muslim peaceful coexistence. Furthermore, the centuries-old coexistence of Iranians and Armenians in the Islamic Republic of Iran, strengthened by historical affinities and close friendship, is another eloquent example of dialogue of life which characterize our societies in this part of the world. We believe that many possibilities of greater collaboration between Muslims and Christians, as well as between Muslims and Armenians in Iran and the world at large do exist, which need to be explored together in the near future. Most of the crises of the world arise from the tension between religious beliefs and values, and human rights. In a brief talk with the journalists, His Holiness Aram I, Catholicos of Cilicia stressed the crucial importance of inter-religious dialogue considering it a "major priority" for all societies. He said: "Religion is no more a private affair; it is an integral part of a community; it is a major force in a society. Furthermore, religion is no more confined to the spiritual spheres of a society; it embraces all aspects of society life". Hence, according to His Holiness, "religion must be taken seriously today". Considering the "Multi-faceted role" of religion as a potential source of both conflict and progress, Catholicos Aram I warned about "the negative repercussions of the misuse or abuse of religion". His Holiness Aram I believes that it is time that religions "transcend their theological divergences and strengthen their common spiritual and moral values which will provide for them a strong basis for common action". In response to a question, Catholicos Aram I called for a clear distinction between religious beliefs and values, and human rights. He said: "Religions have different perceptions concerning these realities and their inter-conncectedness. For some they are in creative inter-action, for other they are in tension; and many of the conflicts and crises of the world today arise from this contradictions and polarizations". According to His Holiness, this particular area needs a deeper and critical analyses in the context of inter-faith dialogue . Speaking about the expectations of people from the religions, His Holiness pointed out that "people are in search of meaning for their life they are looking to religion for guidance and direction. Therefore, religions are challenged to redefine and re-articulate their specific vocation in the society", reminded Aram I. His Holiness considers "combat terrorism" a priority area for the collaboration among religions: "Terrorism is an evil force that must be eradicated from our societies. Religions must work together for building the kind of communities which are sustained by moral values as well as by justice, peace and human dignity", affirmed Catholicos Aram I. As a clear indication of the growing importance of inter-religious dialogue and collaboration, Aram I, as Moderator of the World Council of Churches told to the reporters that the World Council of Churches will, at the end of 2004, organize a major international inter-religious conference in Geneva, Switzerland. These statements of His Holiness were made in the context of a Christian-Muslim dialogue actually taking place between the Islamic Republic of Iran and the Armenian Catholicosate of Cilicia, in Antelias, Lebanon. The Armenian Catholicosate of Cilicia will host a dialogue between the Islamic Republic of Iran and the Catholicosate. The first meeting took place in June 2000, in Tehran, Iran. His Holiness Aram I took part in this meeting as the guest of the Islamic Republic of Iran. The Antelias meeting will have two parts. The first part will deal with theological, moral and social issues related to Christian-Muslim dialogue in the context of Armeno-Iranian relations and collaboration. The second part will include representatives from Christian and Muslim dialogue committees, community leaders and other personalities from the region and will address mainly issues related to Christian-Muslim collaboration. Speaking about this conference His Holiness Aram I said: “This meeting is important for two reasons: First, we have a large and well-established community in Iran. Therefore, it is vitally important that we together address issues and challenges pertaining to Armenian-Iranian co-existence. Second, the world of today is one of dialogue, interaction and interdependence. The globalized world challenges all religions to identify and strengthen those common values which sustain the life of societies. Within this context I consider Christian-Muslim dialogue of crucial importance. We must accept and respect each other, and we must collaborate together to face common moral evils that disintegrate our societies, generate moral decay and distort the image of God in human beings”. More than two hundred thousands Armenians live in Iran. They are mainly centered in Tehran, Isfahan and Tabris. The Armenians constitute the largest Christian minority in the country and they have two deputies in the parliament.